The Star Formation and Evolution Team (SFET), Xinjiang Astronomical Observatory (XAO) used Nanshan 25m Radio Telescope (NSRT) to perform a 22 GHz H2O maser survey towards 221 Bolocam Galactic Plane Survey (BGPS) sources and published their research result in Monthly Notices of the Royal Astronomical Society (MNRAS，2015，453，4203—4221 http://adsabs.harvard.edu/abs/2015MNRAS.453.4203X). This is the first important research result after the construction of the 1.3cm molecular line observing system on NSRT. Water maser is one of the most common masers in star formation regions. It is an important tool to trace different revolution stages of massive star formation and to study their physical properties like the dynamic property and the magnetic field. The researchers selected 221 Bolocam Galactic Plane Survey (BGPS) sources with the criteria as (1) the flux of the sources must be more than 5 Jy for 1.1mm band CSO survey data, and (2) they were observable with the 1.3 cm molecular line observing system of NSRT . The NSRT has a half-power beam width (HPBW) of 135.6 arcsec at 22 GHz and its pointing accuracy is better than 18 arcsec. The researchers detected 107 H2O masers (as shown Figure 1), of which 12 are first detected. They also obtained accurate positions of five new H2O masers via the self-developed On The Fly (OTF) observation mode. 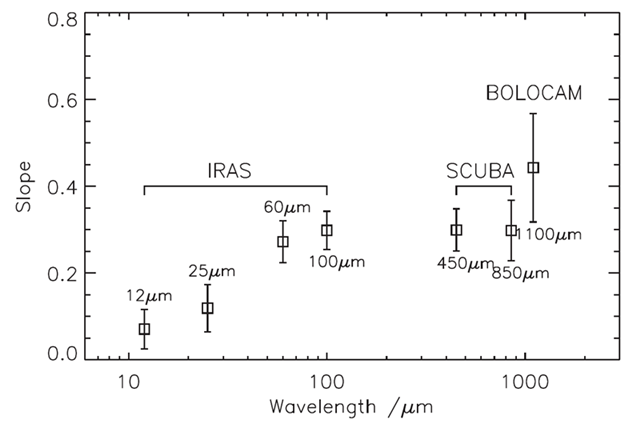 The researchers found that continuum emission fluxes of BGPS sources at FIR and sub-millimetre / millimetre wavelengths have a strong correlation with the detection rate of H2O masers (Figure 2), additionally, the detection rate is also strongly correlated with star formation in BGPS sources. They also found that the BGPS sources associated with both H2O and CH3OH masers are more compact than that associated with either only H2O or CH3OH masers, which indicates that the sources associated with both H2O and CH3OH masers are in relative later evolutionary stage. These results indicate that the combination of water masers and CH3OH masers can be used to trace the evolutionary stage of protostars. Sources without star formation activities at FIR wavelengths also have strong water maser detective rate, which indicates that water maser can be used to investigate very early formation stage of massive stars. Figure 2 the slope as a function of wavelength. The x-axis represents the wavelength of the band. The devices used in each band are labelled above the data. The y-axis represents the slope derived from H2O maser detection rate versus flux density in each band. The error bar is given by least-squares method.